Hey people! Ollie here! I'm taking over my mommy's blog today because I'm a busy toddler with a lot going on and a lot to say! We've been busy lately so I wanted to tell you all about the fun things we've been doing! This last weekend was so much fun! Every weekend mommy and daddy take me to this big park where we throw discs. I love to throw discs! I like to say "ready, set, goooo" and then throw the disc! It's fun to watch mommy and daddy throw the discs too. My daddy throws really far. I tell both of them "nice throw" and they seem to really like that. This last weekend we went to a different park though. 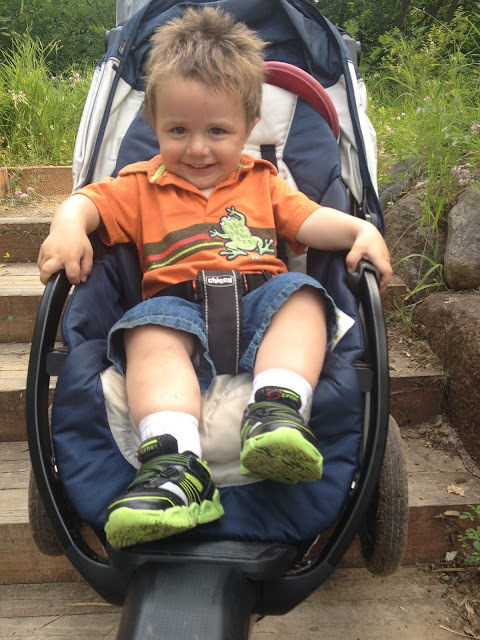 It had a lot of stairs and hills and I got tired of walking so much and had to ride in my stroller. Daddy had to pull me backwards up the stairs and it was hilarious! I couldn't stop laughing! After we were done playing with the discs, we went to a restaurant for lunch. 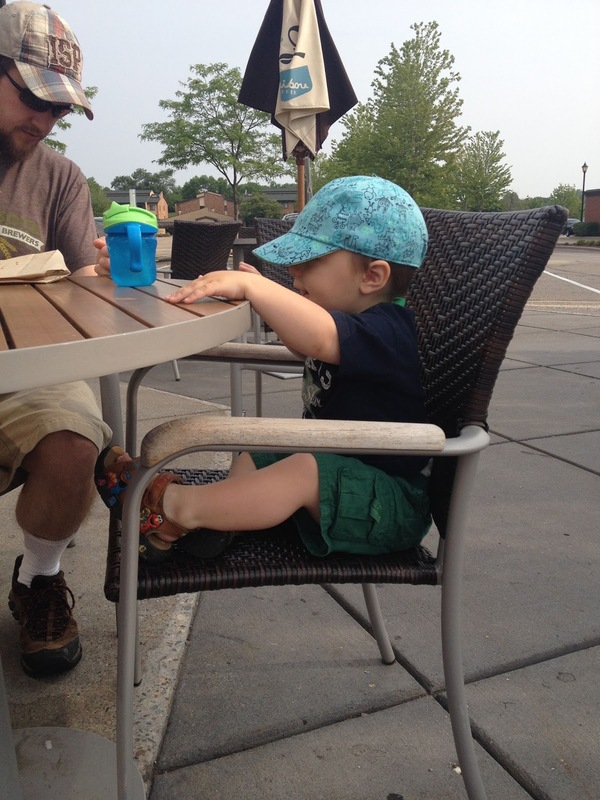 I love going out to eat with mommy and daddy. They always share their food. I sometimes get impatient waiting for the food to come, but mommy always has crackers, so I nibbled on those until my pancake came. Once the pancake came though, it was all about the pancake. I LOVE pancakes! Saturday afternoon was so fun. I guess it was a holiday called Independence Day. That's a hard word to say. Mommy kept telling me to just say "Merica", so I did. Anyway, we went to my grandma and grandpa's house for a picnic with my Uncle Dave. 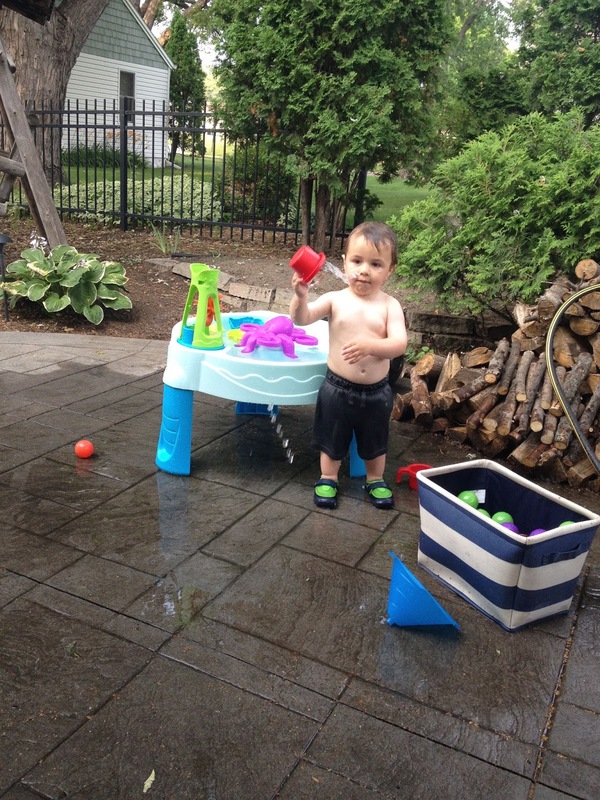 Grandpa fixed my water table so it no longer leaks and I got to play with it for hours! It was so fun, I loved splashing the water everywhere and when the table started to get empty I would ask for "more" from the hose. We ate hot dogs and beans and my favorite fruit - strawberries. Sunday morning we went to Caribou. I love Caribou! 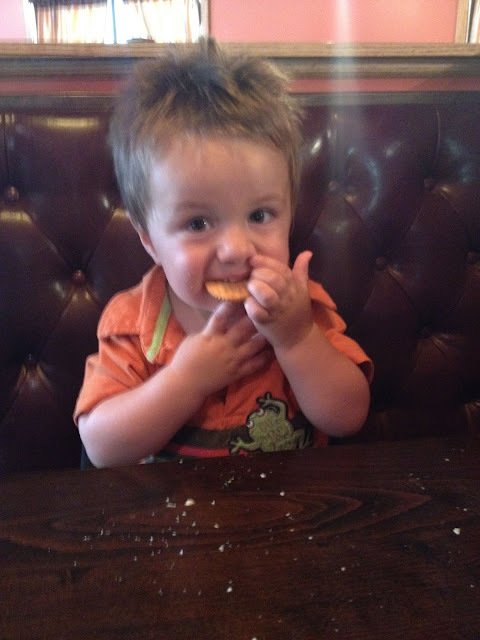 Mommy and daddy get coffee and tea and don't share with me, but they do share their croissant with me and I love that! It's so yummy! 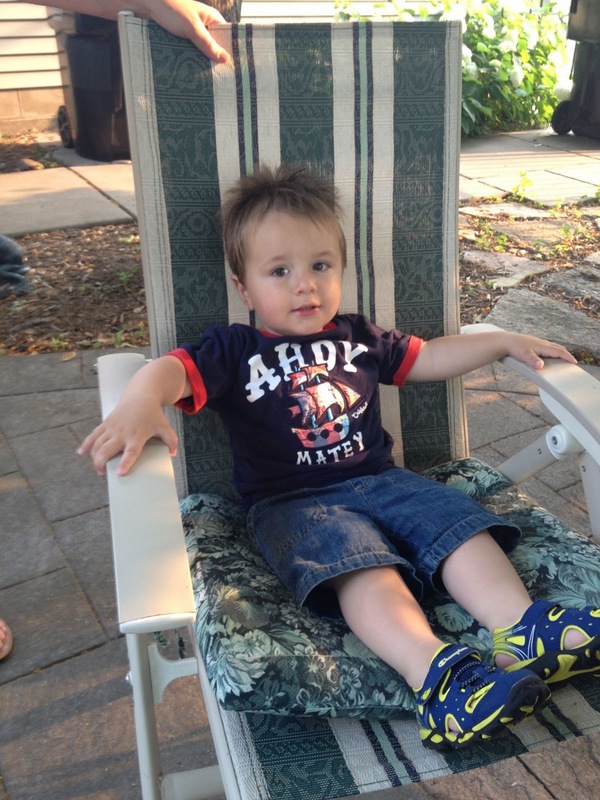 We sat outside and daddy let me sit in a big boy chair! I had to be cool and wear my hat like daddy too. I love my daddy, I want to be just like him! After my nap we went to my auntie Ali's house. Her house is the best ever. She has a swimming pool! Before we went to her house, mommy took me to Target and bought me a floaty toy. 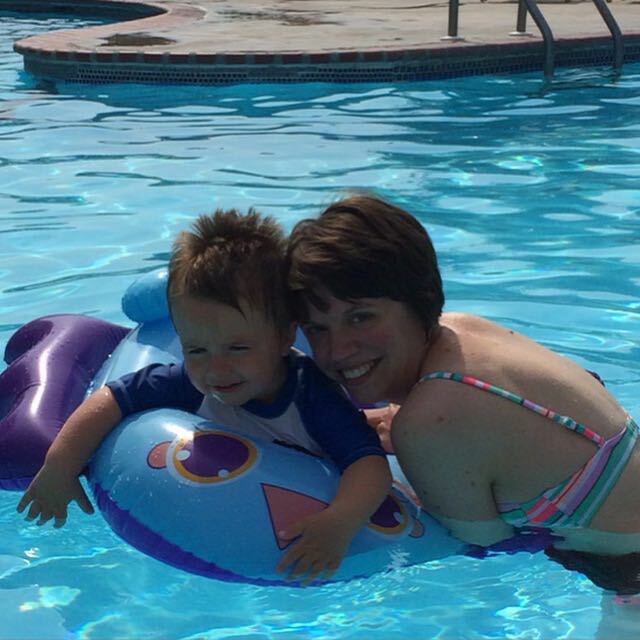 I liked being pushed around in the pool while mommy went "zoooom!" I also love to splash! Water is the best! So, you can see I'm a pretty busy boy! I love summer time, I want to be outside all the time! I was sad on Monday, we couldn't go outside because it rained and then because mommy said the air was bad from some fires or something. I didn't see any fire outside! I didn't understand. But mommy and daddy took me to an indoor playground and that was fun too. Yesterday was better and we went to the park! I sure love the park. I sleep so good on the nights we go to the park!